Since 2004, we have been delivering professional and independent Thermal Imaging Surveys and advice to building professionals, energy consultants and engineers. Our certified thermographers, qualified up to Level 3, are available to perform survey work anywhere in Ireland and at short notice. Using the latest thermal imaging equipment available on the market, we use our expertise, experience and knowledge to help solve your problems by identifying the issues and delivering the correct and appropriate solutions in a timely, comprehensive and cost efficient manner. So why not contact us today and tell us what your problem is. We offer a nationwide service and we can provide you with the necessary Thermal Imaging Survey in a professional, prompt and cost efficient manner. Our service includes customising and tailoring our survey work and reports to meet your specific requirements. 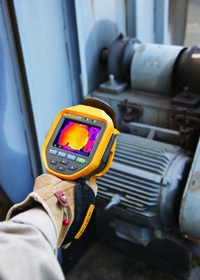 Predictive Maintenance (Electrical & Mechanical) Thermal Imaging Surveys. Our in-house Certified Thermographers have experience of most construction types for both domestic and commercial buildings. Using the latest equipment and software, we can provide you with comprehensive reports detailing the performance of your specific building to the EN 13289 standard, in a simple and graphic manner. Quality of insulation by identifying damaged, missing or under-performing Insulation. In addition to the above, we can also carry out Airtightness Testing. Also known as Blower door testing, air leakage, pressure testing, or permeability testing we can carry out certified testing to the ATTMA standard. Using the latest equipment and software, we perform Predictive Maintenance Thermal Imaging Surveys to help you plan your maintenance schedule and thereby minimise your shut down time. This survey work of Electrical Equipment helps identify poor connections, arcing, overheating, phase imbalances and overloading. Any electrical defects that result in the generation of heat can be readily identified and resolved using infrared techniques. This survey work of Mechanical Equipment is varied. Belts, bearings, motors, refrigeration, HVAC systems – anything that generates high temperature or low temperature, can be successfully imaged without the need for a shutdown, the associated costs or risk to health and safety using infrared techniques. In addition to utilising Thermal Imaging Surveys for Predictive Maintenance reasons, a lot of insurance companies now insist on you carrying out infrared surveys of your buildings before they will provide building insurance cover for you. To learn more about our Predictive Maintenance Thermal Imaging Surveys, or to arrange a booking please email us at [email protected] or call us on 057 866 2162.